QUICKIE BUILDERS ASSOCIATION. . . AN ENDING? It just happened again. During a run to the bank, someone asked, "Oh, you're a builder? I'm wanting to remodel my house, would you be interested?" "No, lady, I'm not THAT kind of a homebuilder!" Does that ever happen to you? It's the ol' name game. Ya know, I never really liked Experimental Aircraft Association either. Sounds like a bunch of test pilots. And, seriously, anything after the first couple of copies isn't really experimental in the true sense of that word. Maybe we should call ourselves something more accurate and prestigious like: Independent Quickie Aircraft Manufacturers Association - IQAMA. YUK! Curses, drats and bat droppings on this computer of mine. Sometime since the first of the year it picked up a bug or a worm or a something in my database. Horror of horrors! Some of you thought I was senile when you got renewal reminders AFTER you'd already anteed up. On my strip of mailing labels for #14 it printed 6 repeats for the last guy. RED ALERT: All youse guys pay attention that your Q-TALK keeps arriving; Mr. Computer here may cut you off. In the meantime, I'm gonna have to go through the drudgery (I think) of reentering 400 names, addresses and phone numbers on a new disk. I could slip up somewhere, so watch me. What I really need to do at this juncture is probably shell out the nickels for an IBM compatible instead of this ol' Kaypro. Once again Tom Gordy hauled my hiney to Lakeland in the Toyota Express. 21 hours and 1,130 miles nonstop (well, pee breaks don't count) can get a fella REALLY primed for a good airshow. I enjoyed this one a lot, but I hope everyone is saving their gas money for Springfield Flockin' because their planes sure didn't show up at Lakeland. The Lone Quegle that saved us from getting disappointedly skunked at Sun 'N Fun was John Groff who, with co-pilot Steve Whiteside, threaded his Tri-Q down through some yuckie east coat weather from New Jersey. Thanks, John. Without him we wouldn't have had an assembly point in the flightline. As it was, there was a Q-2/200/Tri-Q show as I bumped into only 4 Q-1 guys the whole time. Two things made the trip to central Florida worthwhile: First, since Groff's ship was the only one there, we were obligated to examine it in more detail. 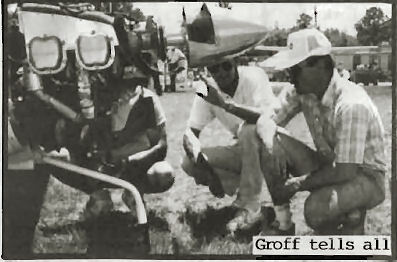 It just so happened that Groff had plenty of interesting details TO examine. Secondly, an interesting and experienced group of QBA builder/pilots made the show. The information exchanged at the Sunday forum (30 folks), Monday (25) and Tuesday (12) was most valuable. The groups were small enough to explore ideas in more depth than usual. I was not disappointed. An added treat was the presence of Don Johnson and wife Nora from England. Don's report was in the last issue, but he expanded on that in details gained from his long experience in aviation and more specifically in his flight-testing of numerous overseas Q-2's. 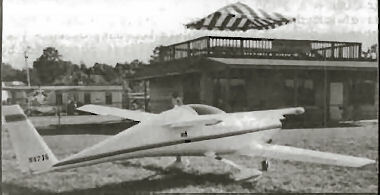 He expects to thoroughly test Bill Elliott's Q-235 which is now a British subject, and he promises to send me a full report on its performance. Incidentally, he already reports that the empty weight of this bird is 840 lbs (the cowling alone accounts for 28 lbs)!!! Believe it or don't. Don reports that the 0-235 powered bird is expected to cruise over 200 mph. It has 4 times the rudder area of a standard airplane and the engine with starter is only 30 lbs. heavier than the 0-200 installation. 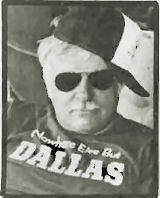 To those curious, Don says they get partial and full airplanes over on shipboard containers or in the bellies of 747's. The 747's go that direction lighter on cargo than coming this way so they are looking for businesses at attractive rates compared to ships. As Groff taxied into the parking area next to a lone Dragonfly, I thought, "Nice plane...too bad he didn't take the time to put on the nose pant." Well, therein lies a story, and it's a good place to start describing the plane. John admits to making imperfect landings once in a while. On one of these he pranged the nose gear (yup, the prop went). He decided his landings just might demand a little more beef up front, and besides, he was experiencing nosewheel shimmy. John described his changes to me. He reformed the nose gear leg out of 1 1/8" x 1/8" wall 4130 steel tubing, heat treated to a Rockwell 40 hardness. This gave him a leg calculated to be 50% stronger, 100% springier and lighter than the original to boot. 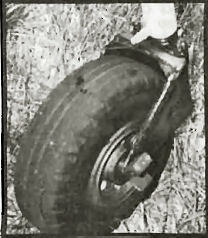 The leg bend at the castoring nosewheel fork was made 6-8 degrees less than the original so that the fork is angled slightly more forward. John believes this helped stop his shimmy. Castoring is good except for the increased torque effect in tight turns. Oh, yeah, the castoring fork got Groff's attention too. He welded gussets on front and sides as well as a stronger stop to prevent complete pivoting. While I was up at the front end, I noticed something fishy looking about the "0-200" cowling over his C-85 engine. John did something several of us have wondered about: He adapted a standard Revmaster Q-2 cowling to fit his Continental. The cowl needed to be lengthened at the firewall so he first sanded the aft 4" of the cowl into a gradual taper then added 4-5 overlapping plies, each one with about an inch less with (just like the plans description for making wing repairs, etc.). The cowling needed slight adjustment just behind the spinner and the right forward "corner" needed to be pushed out slightly on the top half. The final touch was to copy the bottom scoop section from a Q-200 cowl and graft it onto the Q-2 cowl. A bit of labor to be sure, but a saving of maybe $300. John took off the cowl to let me snoop and, quick as a flash, a crowd started gathering. 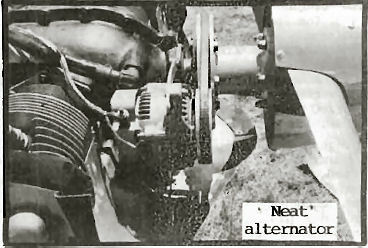 The Chevy sprint alternator mounted on the front top of the engine captured a lot of interest. The C-85 baffling was essentially the same as that on a 0-200. John noted a great area for suction under the cowling at the firewall/canard junction. He was getting an oil streak down the belly, which was solved by wiring the oil breather line so that it was unable to flop back into this area. Groff was surprised that his C-85 was a noisier installation than the 0-200 of Mitch Strong. He thinks that the 0-200 Lord mounts of the 0-200 make the difference. Externally, the plane is the typical overall white with a nice touch of color added by the use of readily available, multi-color automotive striping tape about 3" wide. John says this is cheap, easy to apply and has withstood 65 hrs. of 175 mph cruising with no indications of peeling. Careful observers will note the extended Waddelow wing and canard (but only 15" on each tip) that John is very satisfied with. He says it probably cuts down on top speed slightly. Top now is about 175 mph (and no nosewheel pant, remember). He originally used a 60 x 66 prop that turned only 2250 rpm at takeoff, but now has a 60 x 60 DeMuth prop doing 2450 on climb and 2600 up to 7,500'. We hope to get some good comparisons as partners Weishaar and Doyle are also test flying a C-85 Tri-Q. At our forum their initial data was 2600 rpm and 25" MP turning a self-made 58 x 68P prop topping out at 175 mph at 3,000' with a cool OAT. Cruising speed is 165 and they're using an Ellison carb (they also have updraft cooling which is cooling their engine too well). These guys and a couple others were suspicious that their airspeed readings might be a bit high and it may be that the plants pitot location is not optimum. Bob Malechek has fussed around with this same problem on his successful Q-200, and I reported earlier on the new pitot location that he was finally satisfied with for his Q.
COCKPIT COOLING: Several pilots were not satisfied with cockpit cooling airflow, although Canadian Hans Parnigoni said he and his partners were. 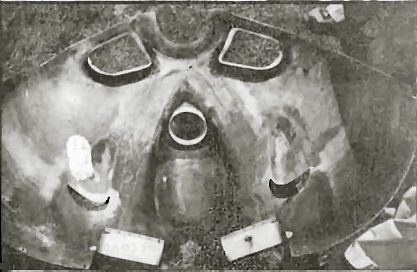 It was speculated that the NACA intake vent might be relocated further forward and that more or larger exit air "gills" could be located in the negative air just under the main wing. REVMASTER ENGINE: Langley and Whetsten, two of 5 successful operators from Springfield agreed that the key to minimize valve problems was to make darn sure that the heads were very well cooled. Langley also said that in order to get the engines to run right, he had to file the carb needles in every one of the 5 ships at Springfield. In the exhibit buildings, I had a conversation with VW Guru Steve Bennett of Great Plains Aircraft who said he had overhauled 6 Revmasters and found that case cracks on the front of the engine was not uncommon (McAndrew sent photos of his, printed in an earlier Q-TALK). RUDDER CABLES: Don Johnson pointed out that rudder cables SHOULD NOT be routed to the rudder first and then to the tailwheel because the rudder hinge/bearing would be more likely to fail under the large direct forces that could be applied with that sort of rig. For the same reason, Jim Langley said that on the Springfield Tri-Q's they mounted a bellcrank in the tailcone then ran cables from rudder pedals to bellcrank then cables from the bell crank to the rudder horn. The bellcrank can thus soak up any unusual forces before they are transmitted to the rudder horn. RUDDER TRAVEL: Don Johnson urged all builders to confirm that their rudder travel is exactly as specified in the plans. He found one in England that wasn't. Don't rush to the conclusion that you need more rudder area until you are operating with proper travel in the first place! SHEEHAN RESPONDS (? ): This is a mixed bag. While a couple of builders are unable to reach him by phone, and a third has gone 2-3 weeks without a response to his letter, John Hicks reported a very quick response to a request for replacement elevator pivot parts (see last Q-TALK). (A Quickie builder reported on a favorable experience when he found that Yellow Freight Lines had speared one of his carbon spars with a forklift. 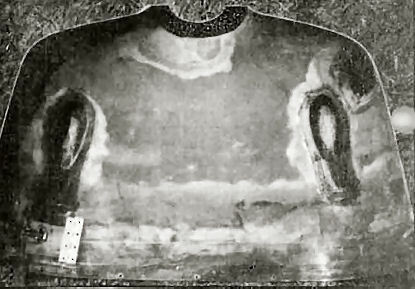 Since his wife signed for the load without noting damage, Yellow balked and the builder conferred with Sheehan who promptly sent another set and (presumably) took on Yellow himself for damages). NOTABLE PRODUCTS: Good Lorans are getting cheaper. I saw II Morrows for $800. ICOM handheld radios with nav ability were as low as $470. Great Plains Aircraft has a build-it-yourself strobe light kit for $37. And I won't soon forget a ballistic recovery system video and testimonial letters that I saw. These systems, which weigh about the same as a backpack parachute (16 lbs. ), will deploy a chute in 3 seconds and readily handle a Q-1's weight. An ultralighter fired off his at 100' agl and walked away intact!!! Sign me up, brudder! I'm at the Red Roof Inn with 5 QBAers. 6/2/89 Friday Arrivals in the p.m.
6/3/89 Saturday 8:00 a.m. Breakfast at SHONEY'S (N. Glenstone) Everyone welcome, Dutch treat again. 9:00 a.m. Arrive at the airport and organize. 10:00 a.m. Masal will conduct a loose QBA Q&A session. 1:30 p.m. Bernie Kerr talks on canard theory, esp. with respect to the Q-2 or Masal continues a Q&A session, or Langley talks on final finishing techniques. 4:00 p.m. Masal conducts summary/day's wrap up. 8:30 p.m. Group holds a buffet dinner/hangar flying at WESTERN SIZZLIN' on Kearney. 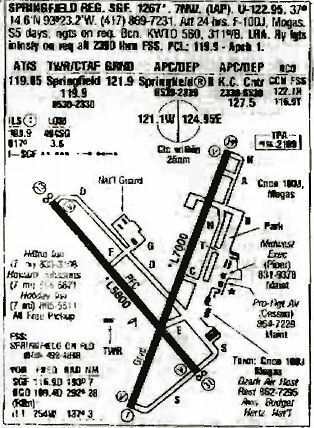 6/3/89 Sunday 8:00 a.m. Breakfast at the APPLE INN at Willard, MO just north of the airport. 9:30 a.m. At the field, Final QBA Discussion, look-around, cleanup and departures. You can order a PDF or printed copy of Q-talk #15 by using the Q-talk Back Issue Order Page.